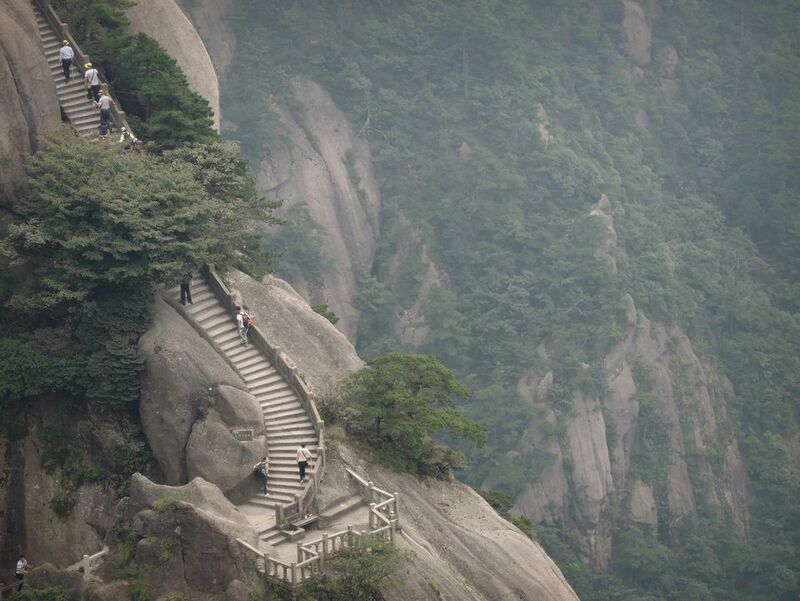 Huangshan literally means yellow mountain in Mandarin. It is a scenic area that covers more than 100 square miles (250 square kilometers). The mountains are characterized by their granite peaks and pine trees jutting out at odd angles. If you've ever seen a classical Chinese ink painting in which the mountains are impossibly angular, it's likely the painting was a landscape of the Yellow Mountains. Chinese tourism authorities say Huangshan is famous for its four wonders: the wind-carved pines, spectacular granite peaks, a sea of clouds, and hot springs. More often than not, Huangshan is shrouded in mist, making it especially picturesque. Huangshan is one of China's UNESCO World Heritage Sites. It is called Yellow Mountains because, during the Tang Dynasty, Emperor Li Longji believed that the Yellow Emperor became immortal here, so he changed the name from Black Mountain to Yellow Mountain. Huangshan is located in southern Anhui Province. Huangshan City is connected by bus, train, and airplane to the rest of China. Overnight trains are available from certain cities, but flying into Huangshan is a preferred way of getting there. The airport is located about 44 miles (70 kilometers) from the scenic area. There are two routes to the peaks: cable car and trekking. It should be noted that regardless of how you decide to reach the top, you should discuss it first with a local travel operator, who can help you decide how much time you need to reach the peaks, how much time you need to get down, and if you want to spend the night at the top. You don't want to be caught on the mountain unprepared. There are three different cable cars that take visitors to different peaks within the mountain range. Lines for the cable cars can be very long during peak seasons, and it's a good idea to factor this into your trip. Cable cars stop operating after 4 p.m. so factor that into your plans as well. Many visitors use the cable cars to go up the mountain and walk or trek back down, or vice versa. Mountain paths cover much of the mountain. Keep in mind that these mountains have been trekked by millions of Chinese people for thousands of years, and the paths are paved in stone and have stone steps. While this adds a level of civilization to your trek, it can make the paths more slippery in inclement weather, which is often, so you should wear the correct footwear for possible conditions. Porters are available to take your bags if you are planning to spend the night at the peak. You can negotiate a price with them at the bottom before you begin your trip. Sedan chairs are also available for hire, so if you decide you want to trek without actually walking, this is also possible. A visit to Huangshan is all about the scenery, particularly the sunrise. People flock to the mountain to watch the sunrise over the misty peaks. China has a particular affinity for naming peaks, valleys, certain crags, and certain trees with names that are reminiscent of other things. So you'll visit many places with interesting names such as Turtle Peak, Flying Rock, and Begin-to-Believe Peak. A typical overnight tour to Huangshan usually involves a cable car up to the top of one of the peaks early on Day No. 1, followed by checking into your hotel and then going for a trek to see some of the scenery. On Day No. 2, you get up before sunrise, camera in hand, to watch the magic of the sun coming over the peaks. You then spend the rest of the day trekking down. There are a number of hotels on various peaks in the mountains. Scenes of the popular movie "Crouching Tiger, Hidden Dragon" (2000) were filmed in Huangshan. China a Ski Destination? Believe It or Not, It's Becoming So! Going to Zhejiang? What to See and Do.